Fall has arrived, and our market stands are overflowing with a great variety of fresh picked local apples and pears. 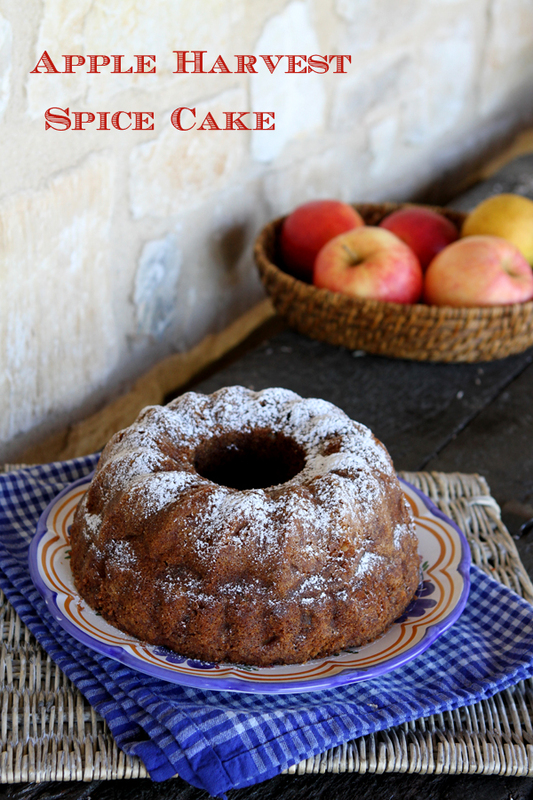 I truly love a good tasting apple, and have been busy recently making Roasted Applesauce, Apple Compote, Apple Bran Muffins, and this tasty Apple Harvest Spice Cake. I am really doing all I can to celebrate Apple Harvest! I first made this cake for our farmhouse guests and was told that they loved it so I needed to make it once more to taste it myself. 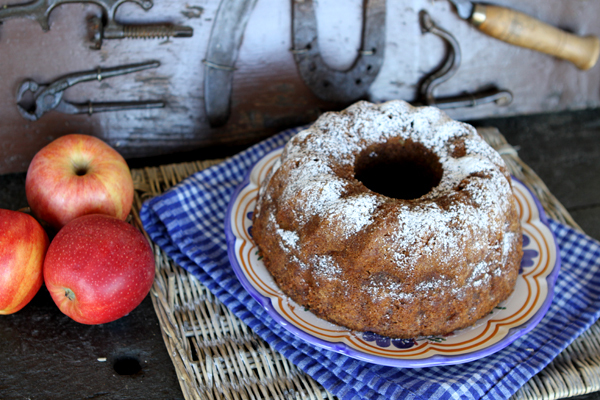 I have since made this cake a couple more times, tweaking the recipe, and even using pears once in place of apples. This is a really moist cake that for me doesn’t need any glaze or icing, though feel free to add it if you prefer your cakes iced. I found that me this cake was perfect with just a dusting of powdered sugar, though I am not a big fan of iced cakes as a rule. I did serve the cake to guests once with a dollop of cinnamon flavored whipped cream which dressed the cake up perfectly. 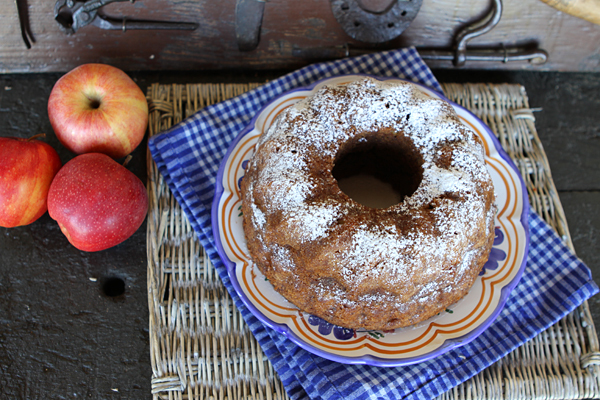 The adjustments I made to this cake to make it a little healthier were to replace some of the all-purpose flour with almond meal, and to use half the oil listed replacing the other half with applesauce. You could replace the almond meal with whole wheat pastry flour if you prefer. I also replaced the white sugar with a combination of coconut palm sugar and honey. For the best results, use a baking apple such as Granny Smith, Braeburn, Jonagold, or Golden Delicious. If you choose to use pears instead, any variety of very ripe pear will work well. Coconut date sugar and honey replace white sugar, while the oil in this cake is cut in half and replaced with applesauce. Preheat oven to 350 degrees F. and lightly grease and flour a 10-inch Bundt pan. In a bowl, beat together the eggs, sugar, and honey on medium speed until fluffy, then pour in the vanilla, oil, and applesauce and beat until blended. In a separate bowl, stir together the two flours, salt, baking powder and soda, cinnamon, nutmeg, and allspice. Pour the dry ingredients into the egg mixture and mix well. Add the walnuts, raisins and pears and fold until mixed. Pour the batter into the prepared pan and bake for about 45 to 50 minutes or until a cake tester inserted into the center of the cake comes out clean. Cool for 15 minutes, then turn onto a wire rack to cool completely. Lightly dust with powdered sugar and enjoy!